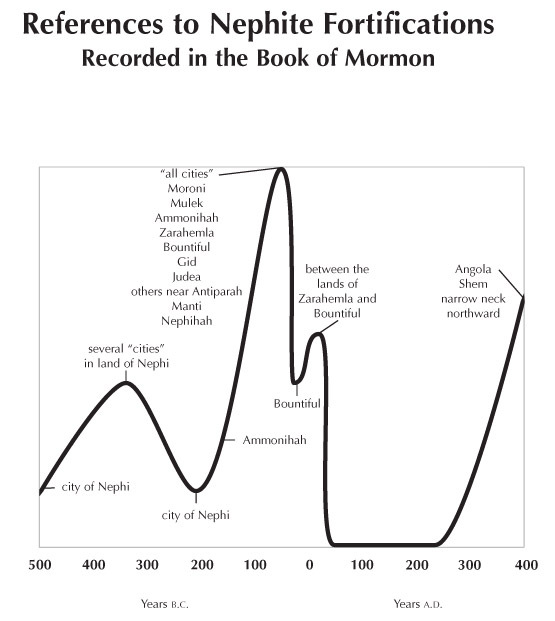 As is shown by this graph, the Book of Mormon records that more known fortifications were built between 75 B.C. and A.D. 15 than at any other time in Nephite history. The building of these fortifications can be divided into four Nephite periods and one Lamanite period: (1) the Nephites in the land of Nephi from the sixth century B.C. to the third century B.C., (2) Zeniff 's rebuilding of the wall of Nephi in the second century B.C., (3) extensive work by Captain Moroni and his successors from approximately 75 B.C. until at least A.D. 15, (4) the Lamanites' effort in the first century B.C., and (5) the Nephites in the final wars before their destruction (late fourth century A.D.). In the first period, the Nephites "began to fortify [the] cities" that they claimed as an "inheritance" (Jarom 1:7), in addition to the city of Nephi (see Jacob 7:25). In the second period, the walls of the city of Nephi must have been prominent, for they are mentioned four times (see Mosiah 7:10; 9:8; 21:19; 22:6). The innovative construction of fortifications at several sites is described in considerable detail during the third period (see Alma 49:2–22; 50:1–11; 53:3–7). More than ten fortified cities are mentioned specifically in this major period, and at least five sites in the final period.